Due to climate change, drier summers have been observed over the last ten years in Mediterranean areas. Increasing drought levels may have a different weight in influencing the stomatal versus photosynthetic activity of forests, altering the water-use efficiency (i.e., WUE, the amount of carbon gain per water lost) and, consequently, the global carbon balance. By combining leaf gas exchanges and leaf carbon/oxygen isotope measurements, we tested under Mediterranean conditions a semi-quantitative dual isotope model to track adjustments in stomatal conductance (gs) and maximum CO2 assimilation at saturating light (Amax) in response to changes in air and soil water availability. The experiment was established at Allumiere site (Rome, Italy) over the course of two consecutive years. There, we modified the amount of precipitation reaching the soil on water depleted (D) and watered (W) replicate plots (~100 m2) of an Arbutus unedo L. forest using a system of rain gutters and sprinklers, respectively. Changes in soil water availability affected gs and Amax in parallel. As an application of the model, we found that, in response to reduced air and soil water availability, constant carbon (δ13C) and increasing oxygen (δ18O) isotope values were consistent with a parallel decline of either gs and Amax. As a result of parallel decline, WUE did not differ or only slightly differed between treatments, in contrast with most of the studies that found a wide-spread increase of WUE in response to enhanced drought. This study highlights the potentiality of the dual isotope model to provide insights of forest ecosystem functioning in Mediterranean environments. A model predicting stomatal conductance and its contribution to the control of photosynthesis under different environmental conditions. In: “Progress in photosynthesis research” (Biggens J ed). Martinus Nijhoff, The Netherlands. Oxygen isotope ratio of leaf and grain material correlates with stomatal conductance and grain yield in irrigated wheat. Australian Journal of Plant Physiology 27:625-637. Relative humidity and ABA-induced variation in carbon and oxygen isotope ratios of cotton leaves. Plant Cell & Environment 23: 473-485. Water relations, gas exchange, and growth of resprouts and mature plant shoots of Arbutus unedo L. and Quercus ilex L. Oecologia 98: 201-211. Response of a mature Pinus laricio plantation to a three-year restriction of water supply: structural and functional acclimation to drought. Tree Physiology 22: 21-30. Deuterium and oxygen 18 variations in the ocean and the marine atmosphere. In: Proceedings of “Conference on stable isotopes on oceanographic studies and paleotemperatures” (Tongiorgi E ed). Lischi & Figli, Pisa, Italy, pp. 9-130. Relationship between the oxygen isotope ratios of terrestrial plant cellulose carbon dioxide and water. Science 204: 51-53. On the enrichment of H2 18O in the leaves of transpiring plants. Radiation and Environmental Biophysics 11: 41-52. Carbon isotope discrimination and photosyntheis. Annual Review of Plant Physiology and Plant Molecular Biology 40: 503-537. Carbon and oxygen isotope effects in the exchange of carbon dioxide between plants and the atmosphere. In: “Stable isotope and plant carbon water/water relations” (Ehleringer JR, Hall AE, Farquar GD eds). Academic Press, New York, USA, pp. 47-70. Interpretation of oxygen isotope composition of leaf material. In: “Stable isotopes integration of biological ecological and geochemical processes” (Griffiths H ed). Bios Oxford pp. 27-62. Drought-inhibition of photosynthesis in C3 plants: stomatal and non-stomatal limitation revisited. Annals of Botany 89: 183-189. Stomatal mesophyll conductance and biochemical limitations to photosynthesis as affected by drought and leaf ontogeny in ash and oak trees. Plant Cell & Environment 28: 834-849. Adaptive strategy at the leaf level of Arbutus unedo L. to cope with Mediterranean climate. Flora-Jena 197: 275-284. Differential response of leaf conductance carbon isotope discrimination and water-use efficiency to nitrogen deficiency in maritime pine and pedunculate oak plants. New Phytologist 131: 149-157. Climate change 2007: climate change impacts adaptation and vulnerability. Forth Assessment Report. Summary for Policymakers. IPCC Working Group II. Modelling stomatal responses to soil and atmospheric drought. Journal of Experimental Botany 49: 399-406. Carbon dioxide and water vapor exchange by young and old ponderosa pine ecosystems during a dry summer. Tree Physiology 21: 299-308. Photosynthetic carbon assimilation and associated metabolism in relation to water deficits in higher plants. Plant Cell & Environment 25: 275-294. A critical appraisal of a combined stomatal-photosynthesis model for C3 plants. Plant Cell & Environment 18: 339-355. Estimation of mesophyll conductance to CO2 flux by three different methods. Plant Physiology 98: 1437-1443. Sap flow of three co-occurring Mediterranean trees under varying atmospheric and soil water conditions. Tree Physiology 23: 747-758. Drought controls over conductance and assimilation of a Mediterranean evergreen ecosystem: scaling from leaf to canopy. Global Change Biology 9: 1813-1824. Variation in nitrogen supply changes water-use efficiency of Pseudotsuga menziesii and Populus × euroamericana; a comparison of three approaches to determine water-use efficiency. Tree Physiology 24: 671-679. Physiological and structural changes in response to altered precipitation regimes in a Mediterranean macchia ecosystem. Trees (in press). Recent decline in precipitation and tree growth in the eastern Mediterranean. Global Change Biology 13: 1187-1200. Oxygen isotope analysis of cellulose: an interlaboratory comparison. Analytical Chemistry 70: 2074-2080. Linking stable oxygen and carbon isotopes with stomatal conductance and photosynthetic capacity: a conceptual model. Oecologia 125: 350-357. Variation in leaf physiology of Salix arctica within and across ecosystems in the High Arctic: test of a dual Delta C-13 and Delta O-18 conceptual model. Oecologia 151: 372-386. Time domain reflectometry (TDR) and its application to irrigation scheduling. In: “Advances in Irrigation” (Hillel D ed). Academic Press, New York, 3: 107-127. 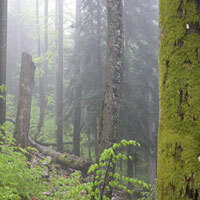 Water stress decreases the transfer conductance of Douglas-fir (Pseudotsuga menziesii) seedlings. Tree Physiology 24: 971-979. Stomatal conductance correlates with photosynthetic capacity. Nature 282: 424-426. Variations in the natural abundance of oxygen-18 and deuterium in plant carbohydrates. Plant Cell & Environment 15: 1005-1020.